Issues by MP's rehabilitation officer of the Narmada Valley Development Authority (NVDA), the notice, quoted by the anti-dam Narmada Bachao Andolan (NBA), states that if the PAFs do not collect compensation in lieu of the land “within 2-4 days” (i.e. by December 30, 2016), which is up to Rs 3 lakh, they would be deemed as rehabilitated, and the amount would be deposited with the Revenue Department. According to NBA, PAFs were given the first installment of Rs 2.79 lakh years ago on rejecting the "poor quality" land they were offered years ago, while they have been offered “balance amount” of Rs 2.50 lakh now. Considering this fraudulent, Mayaram, son of Sukya, Village Pichhodi, Badwani district has filed a case against the rehabilitation officials for conspiring to violate the right to land of the tribals, “which is a crime under sections 3, 4, 5 of the Scheduled Castes and Tribes (Prevention of Atrocities) Act, 1989”, says NBA. Adds Kalabai she never received the notice of a plot being allotted to her, yet recently received the notice of collecting her second installment as her eligibility for allocated land has exhausted due to her non-acceptance of the same. 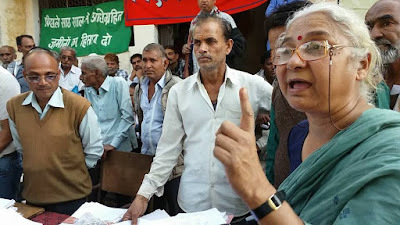 Meanwhile, hundreds of PAFs, under NBA leader Medha Patkar, gathered in front of NVDA’s rehabilitation office in Indore on December 30, questioning the the rehabilitation officer, MP, seeking an explanation why were such “fraudulent, threatening notices” were being issued and under whose instructions. “He admitted that it was done under the oral instructions from the Commissioner (NVDA)”, claims NBA.